"How to get rid of fleas" is a question most pet owners have had to ask at one time or another. For every flea you see on your dog or cat, it's been estimated there are 75,000 in your home! This site is designed to give a quick and informative summary for those experiencing a problem with fleas. 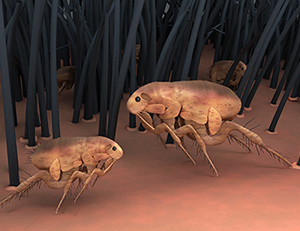 Fleas: How do you know if you have them? If you have a dog or cat, it's likely you have a flea problem. Why? Because flea eggs can lie dormant in a home for up to 2 years, then live and reproduce for up to a year, even if they have no food for up to 2 months during that time. Fleas get around. A flea can travel at up to 1 mile an hour. That may not seem like much, but in flea size, it translates into over 100 miles per hour, and means that every flea within 24 miles of your home is only one day's trip away! The life cycle of the flea begins when they deposit their eggs in your pet's bedding, carpet or other hidden location. They usually hatch within 12 days, becoming a larva, pupa and finally an adult. What Harm Can Fleas Cause? Fleas transmit murine typhus, parasites such as tapeworms and the plague so they are a real danger to you and your family. Many people and animals experience allergic dermatitis reactions. How Did The Fleas Get There? 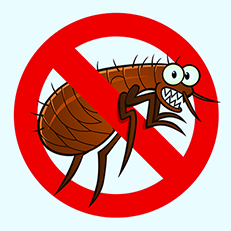 The most common way fleas arrive in your home is attached to your dog or cat during a stay in your backyard. How did they get into your yard? They hitched a ride on rats, mice, raccoons, opossums, skunks and other wild animals. Keep you yard free of wild animals. Spray large yards at 14 day intervals during the spring, summer and fall with chlorpyrifos; dust smaller yards with malathion or diazinon. Give all your pets a bath simultaneously with flea shampoo, follow up with a pet-safe flea repellent dust. Sprinkle salt on your carpet and pet areas before vacuuming (salt dissolves flea eggs), then vacuum a few teaspoons of flea powder into the vacuum bag, vacuum everywhere, then deposite the bag outside the house, sealed in a plastic bag. Do you have an established flea infestation? Since flea eggs can lie dormant for up to 2 years, and fleas can rather easily travel into your home from distant locations, you'll need to apply all of the above preventative measures regularly throughout the spring, summer and fall seasons. If the problem is large or persists, you may need to use a flea "bomb" or fogger twice, 3-6 weeks apart. Fleas are persistent, dangerous and very hard to eliminate. For this reason, it's cost effective to call in a professional flea exterminator who guarantees their work--especially when you consider the more expensive options of medical and vet bills. 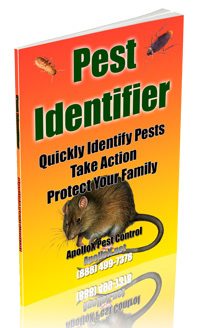 ApolloX Pest Control Has The Skill, Experience and Equipment to Get Rid of Fleas! Do you think you have a flea problem? Don't wait until those 75,000 fleas lay eggs and further multiply!